First appearing on BBC Radio, this Science Fiction comedy from the pen of (the sadly departed) Douglas Adams, spawned five books, a TV series, a computer game, and towels! Phrases from Hitchhikers have passed into everyday life, it’s oft-quoted, and the number 42 achieved universal recognition as a result of this series. If you’ve followed the series or read the books, we highly recommend talking a look behind the scenes to learn more. This includes the DVD bonus material, and the several books available. Coupling Best described as a UK equivalent of Friends, with a heap of Game On and Men Behaving Badly. Top sitcom that ran for four series from 2000 . If you’re a fan, note that we have a Coupling forum for discussion and gossip relating to the series. Please stop by. Knowing Me, Knowing You Alan Partridge in fine form. With a diverse history – starting with hospital radio and the AA, then moving to sports reporting on The Day Today, Alan started his TV career in earnest as a radio, then TV interviewer. Cringe away to Knowing Me, Knowing You with Alan Partridge on DVD. 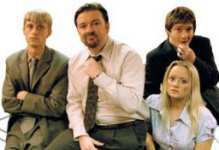 The Office Featuring the boss from hell, David Brent, we’ve now seen two series of the amazingly popular mocumentary set in Slough-based paper company Wernham Hogg. If you’ve worked in an office, you can relate! The DVD of Series One came out in September 2002 – Well worth getting for the bonus material found on the second disc, which includes an excellent documentary, called “How I Made The Office by Ricky Gervais”. See extracts of the pilot, learn the origins of the series, how annoying Ricky is to work with, and how he met co-writer Stephen Merchant (who appeared as the Oggmonster!). Series 1 is available from Amazon on DVD and VHS. Series 2 was released on the 20th October 2003, and is now available now from the BBC Shop.com, or from Amazon. Christmas Special Screened on the 26th and 27th December 2003, the two-part special shows us what happens to David and the team after the series 2 finale. Available from the BBC Shop, or Amazon. Series 3? Nope. Reportedly the team don’t want to do a third. The US Office? If you’re missing your fix of the UK version of The Office – Consider giving the US version a go. Currently at the end of its sixth season in the States, “The Office, An American Workplace” has Gervais and Merchant as the Executive Producers, and actually grows on you. If you haven’t given it a try – it’s well worth a watch. Series 1 is now available on DVD in the UK – from Amazon. FM Comedy set at local radio station Skin FM. Shown in February 2009 on ITV2. Series 1, 2 and 3 of Yes Minister have just recently been released on DVD – See Amazon. Blackadder Another fine example of UK comedy… Edmund Blackadder pops up throughout our history in the four series. Check out the whole damn Dynasty videos, DVDs and books at Amazon. If you thought you’d seen every episode, you may find a few surprises if you check out Back And Forth / The Cavalier Years / Baldrick’s Diary on DVD, although as the reviews state, this not-often-seen material doesn’t match up to the quality of the Elizabethan and WW1 series, my personal favourites. Fans may also want to consider the Complete Blackadder , available from the BBC Shop. Fawlty Towers Surprisingly, only 12 episodes were ever made, with Series 1 in 1975 and Series 2 in 78. There’s no point in describing the series here – everyone knows it, and it’s repeated somewhere in the world several times a day. If you’re a fan of the series, we’d highly recommend the Complete Fawlty Towers DVD – this contains stacks of bonus material, including a commentary, interviews with Basil, Sybil and Manuel, some recovered out-takes, biographies, and extras. The 3 DVD set is well worth a look. Red Dwarf sci-fi sitcom with a huge following. Lister’s plan of raising animal in Fiji goes a little wrong when he’s thrown 3 million years into the future, so resorts to bumming around the universe, tormented by Arnold Judas Rimmer, his hologrammatic bunkmate. A creature that evolved from Lister’s cat, plus the slightly senile computer Holly (Norman Lovett’s doing the stand-up circuit in London at the moment… track him down!) keep him company, and as the series progresses, the team are joined by Kryten, the android, who, if we could go anywhere in history, would return to a week last Tuesday. Look out for the episode “Backwards”… if you can get hold of a copy, reverse the audio of the backwards-spoken dialog for a surprise! Mail us if you can’t find a copy! The earlier few series were undoubtedly the best, but there’s eight series, plus a selection of paperbacks. If you missed any, Holly-hop over to Amazon, where you’ll also find the DVD of Series 1, 2 and 3 (The first DVD has an impressive range of extras including the full version of Cat’s “Tongue Tied”). Green Wing Another excellent comedy from the Channel 4 Friday Night stable, with a top notch cast from Coupling, Spaced, Black Books, Nathan Barley and The Office. The shining light of hospital comedies. Spaced Seriously good Channel 4 comedy about two perfectly-matched flatmates, who just don’t know it. Clever use of classic TV soundtracks and camera angles make this a joy to watch – a refreshing change. Men Behaving Badly Hugely popular 1990’s comedy – Martin Clunes and Neil Morrisey star as Gary and Tony, with Caroline Quentin as Dorothy and Debbie (Leslie Ash). The show ran to 6 series – the oft-forgotten Series 1 had was missing the character of Tony… instead, we had Dermot, played by Harry Enfield. This sitcom has to be one of the most consistently funny series of the 90’s – we never tire of watching the repeats when they appear on UKTV Gold, with some classic one-liners, and some great Tony & Gary moments on the settee. Some of the office moments with George and Anthea are classic moments too. If you’re a fan of the series, you may want to invest in the six DVD collectors edition box set – available from under £30 from Amazon. Game On Another flat-based sitcom, running on the BBC from 1995 to 1998. In this show, we see shy ginger Martin Henson sharing a London flat with the housebound Matthew Malone, and the over-sexed Mandy Wilkins (played by the gorgeous Samantha Janus). Slightly disjointed comedy that ran for three series – the series certainly had its moments, but lacked the clever writing of Coupling, and the chemistry of Men Behaving Badly. Ben Chaplin played Matt in Series 1, and was replaced by Neil Stuke for the last two series. The three series are available on DVD and video, or you can buy all three series as a box set – Game On Series 1-3. Two Ronnies Four Candles Don’t get me wrong, I’m not a huge Two Ronnies fan, but one memorable sketch never fails to make me giggle… Four Candles (a.k.a. Fork Handles). Here’s a link to the script. The sketch is available on BBC compilations on BBC Great Comedy Moments DVD or Comedy Greats – Ronnie Barker Video available from Amazon. Just Good Friends Classic relationship comedy from 1983. Penny (Jan Francis) runs into ex-fiancé Vince (Paul Nicholas) five years after his “bottle went”, and instead of showing up at the wedding, ran off to Canvey Island. This starts a love-hate relationship between the two, that ran for 3 series (22 episodes) until ending in 1986. Much of the external locations were filmed in Southend-on-Sea. In May 2004, the beeb released series 1 and 2 on DVD. If you fancy a flashback to the 80’s, buy the DVD or video from the BBC Shop or Amazon. Little Britain Starting life on BBC Radio, the double act of Mark Lucas and David Walliams created an impressive collection of characters that made the transition to TV in 2003. The Robinsons Martin Freeman… (a.k.a Tim from The Office / Arthur Dent from the Hitch-Hiker’s Guide film), stars in this little-known UK comedy screened on BBC2 in mid-2005. This gentle sitcom takes a look at the life of the Robinson family – the loaner Ed Robinson, brother George and his family, ambitious sister Vickie, and the ever-rowing parents. Well-observed British humour, with a fair number of funny moments – I assume we’ll expect a Series 2 sometime soon, and hopefully a DVD release soon. Anybody else watch this series? KYTV KYTV started life on BBC Radio 4 as Radio Active (Britain’s national local radio station). If we’re honest – KYTV wasn’t a patch on Radio Active, but it’s still got its charm, there’s a lot of classic Radio Active moments, and, considering it was made in 1989, it’s still a fresh and inciteful comment on today’s multi-channel satellite TV world. More on KYTV at TV Tome. Tune in to see Mike Flex, Mike Channel, Martin Brown and Anna Dapter, as they scramble to hang on to their TV audience – still a great watch, and it’s good to see the Radio Active team back together. Series 1 released on DVD in July 2006 – available from Amazon (for £11.99) and Play.com(£11.99). The DVD includes the pilot episode. The IT Crowd Started its run in February 2006, from the co-creator of Black Books and Father Ted, this centres around the working lives of three IT professionals sulking in a company’s basement. Peep Show Odd and edgy Channel 4 comedy looking at life from the viewpoint of housemates Jeremy and Mark. Trigger Happy TV The antics of Dom Joly winding up members of the public in style, and setting up celebrities. Joking apart From the pen of Stephen ‘Coupling‘ Moffat , this little-remembered break-up comedy from 1993 has a site dedicated to it at www.jokingapart.co.uk. Chance in a Million Channel 4 sitcom from 1984 cataloging the life of Tom Chance, a victim of circumstances (played by Simon Callow). The love interest for Tom was Alison (played by Brenda Blethyn). Looking back, I remember some similarities between the bizarre events that intersected Tom’s life, and the storylines that unfold in later episodes of One Foot in the Grave. The series ran for three series in the 1980s. This is another series we’d love to see again, or better still, revived on DVD – just to refresh fading memories. Guess the Sitcom personality – very clever stuff!